I've switched my shipping suppliers this year due to some very disturbing news that came to public light about my original supplier, and I wanted to share my new favorite places to get supplies so that you could also make the switch. Sourcing requires a huge amount of time and resources to research and try out different products (in corporations, it's someone's entire job! ), so I don't often share my suppliers but I wanted to make it easier in this special case to support and build better businesses and in turn, a better world. It's important to vote with your dollars, especially when you're running a business and you get to make these decisions. Resistance and change starts with small steps, even these. • PaperMart - I get my flat shippers for prints and boxes for pins and larger items from here. • ClearBags - all my sleeves and backing boards come from here, they also have eco-friendly packaging too that I'll be checking out with my next order! • Amazon - when I need things in a pinch (Prime shipping! ), more hit or miss so read the reviews! • EcoEnclose - this one was recommended to me on IG so I haven't tried them out yet, but I'm switching to more eco-friendly packaging as I move forward with my business in 2018 because I think it's important to be conscientious of the trash we're creating in this world. It's gonna be a major issue if we don't! • Kelly Paper - recommended by my friend Jian of Bearo, I also have gone to Kelly Paper before to pick up plastic sleeves. It's best to go in store, so they're good if you're in a pinch! Please let me know if you have any favorite shipping/packaging supply places in the comments! "Caring for myself is not indulgence, it is self-preservation, and that is an act of political warfare." So shirts are now available with my handlettering, with 100% of my artist's commission going to support the ACLU. The shirt will be available until February 28, 2017, so act fast & grab one here now! Hello friends! Exciting news: I decided to go pro and open my own online shop! To celebrate the grand opening, I'm offering 20% off your entire order with coupon code WELCOME20. Code valid until 11:59pm PST, Thursday 4/14. Lots of fun things are planned in the months to come, starting with my Harry Potter/Hogwarts Yearbook series of original mini paintings that go on sale tomorrow, Friday 4/15, at noon PST. Check out the new shop here and let me know what you think! So much has been going on lately that I've barely had a minute to sit down and update this space! Thank you if you're still reading here! In a world where social media dominates, things seem to speed by so fast that it's nice to take a moment to reflect on all the things going on. For now and for posterity. I'm dropping in today to share that my collection for fabulous tech case company Casetify is now live! 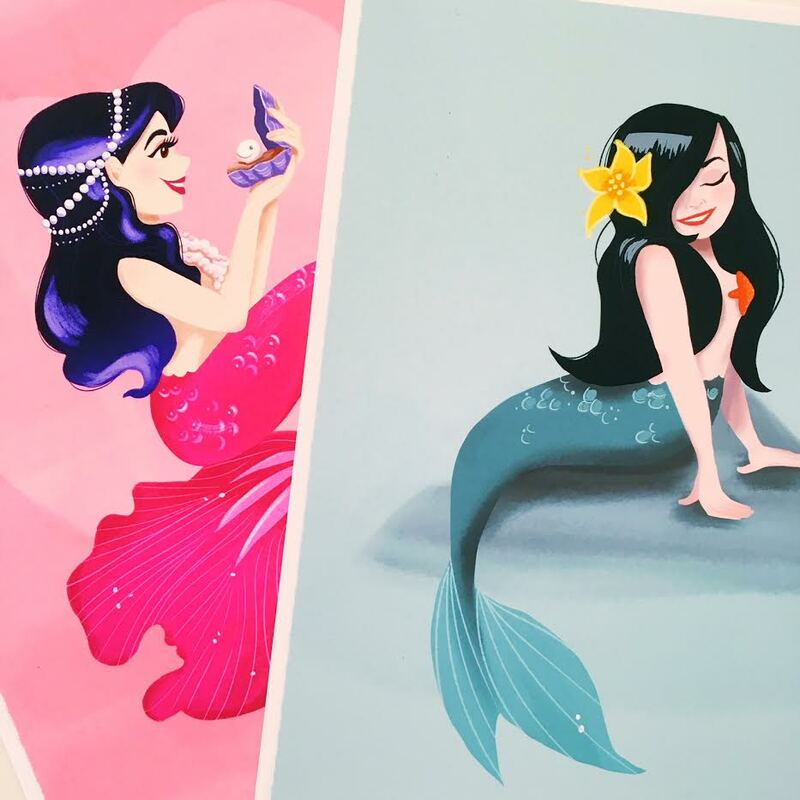 If you've been looking for the perfect phone case for your mermaid life, then look no further than shopping this link right here. It's great to be able to share my work across so many platforms, so you can get as many options as possible to affordable art. After all, art is what makes life worth living, right? Let me know if you get one! I'd love to see you & your stylish phone out in the wild. P.S. Oh and because Casetify is so egalitarian, there are cases for every phone! Hi friends! I'm so excited to share that I'll be part of a one-day pop-up shop at the super cute Shout & About in Echo Park, Los Angeles! 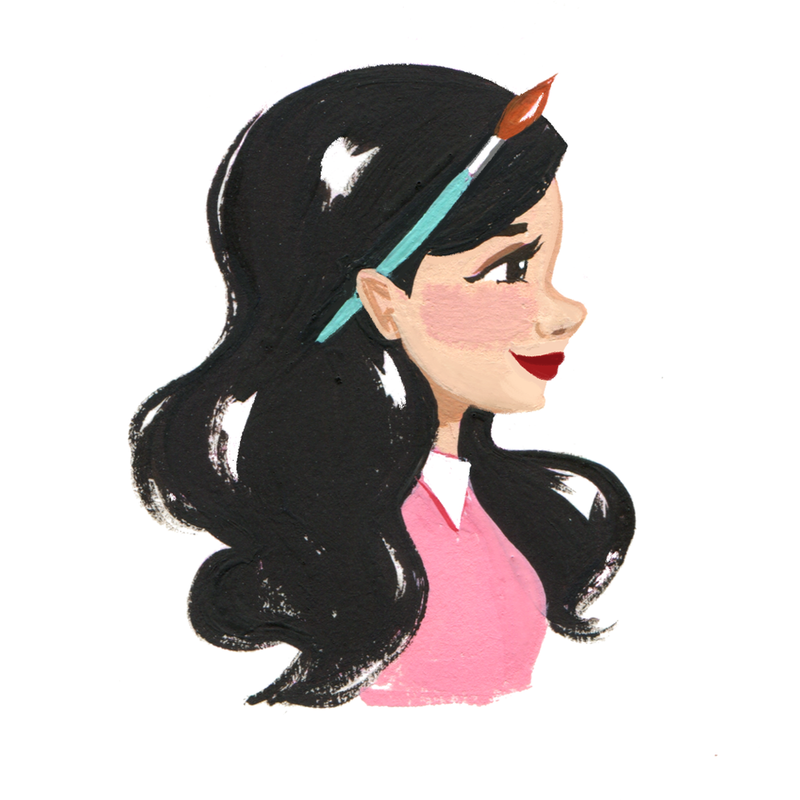 I'll have my complete collection of prints, paper goods, and gift goods -- including stuff that isn't even up on my online shop and new exclusives! Blue Elf Succulents will be there with darling potted gardens, Shout & About will be hosting with pink lemonade, mini donuts, and California mimosas* (*a term I just made up for pink lemonade mimosas). At the beginning of this year, I was having a bit of an existential crisis. I had quit my in-house design job to focus full time on my freelance career at the end of October. I went on a magical adventure to Paris the week right after, then came back and jumped into show season (with DesignerCon, CTNX, and Renegade Craft Fair all within four weeks), got hired onto an exciting freelance project that committed me into the new year, and then the dust settled in January. The dust settling was welcome, and I've been fortunate that the freelance jobs have been steadily coming; but the unstructured, amorphous shape of my future was stunning. Stunning in a catatonic way – it was the first time in my entire life that I haven't been scheduled to the gills. I left my job for a myriad of reasons, but the most outstanding one being that my freelance work was growing to a point where it could sustain my life, and my schedule of doing both was growing to a point that was going to kill me. So back to January. I was having lunch with my friend Eileen, and we were both at the beginning of starting something new. We were both kind of scared, really excited, and already exhausted at the ideas of our individual businesses. I shared a quote I had read somewhere (still can't hunt down a real origin, so let me know if you know): the grass is greenest where you water it. From that moment, it was my mantra for 2015. It's been paying off in ways I can't wait to share, but I also lettered this piece throughout the last couple months – in the moments I found it hardest to believe in this quote. But it always turned me back around, helped me focus on the right things instead of dwelling on the negative. Hopefully it can do the same for you. You can find the print in my shop if you'd like to make it part of your life. Hi there! How have you been? Things have been absolutely nutty in my corner of the world, which I feel like I say every time I check in here. There have been a lot of developments going on that I'll share in another post, but here's one of them: the continued roll out of the City Love series! 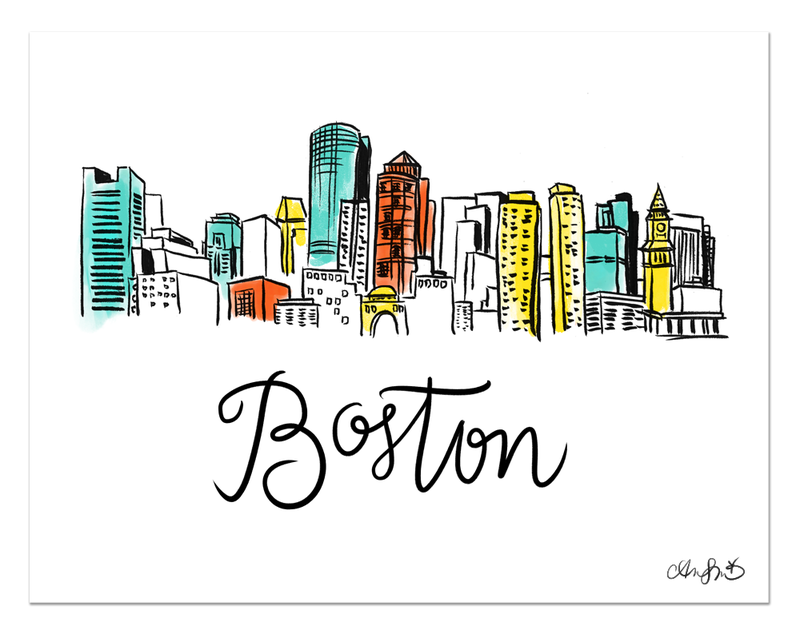 I'm finally debuting the East Coast city prints, and they're available for purchase in my shop here. Up top, you have New York City. Then Boston, Washington D.C., and Miami! I'm rolling out four more U.S. cities and four international cities to make the first edition of 16 available by December 1st for your holiday ordering needs. Let me know what the last 8 cities should be in the comments! Earlier this week I was having a meeting of the minds with my friend Marlo, and she helped me brainstorm new ideas for the upcoming holiday shows. This was one of the (many) brainchildren from our conversation, a series of City Love prints. I knocked out the first four to show some West side love, which you can now make your own in my shop! The radio silence around here lately has been in large part due to my gearing up to table at WonderCon for the first time ever! I've been scheming & printing up a storm to make new prints and designs to share at the largest event I've ever done. And now it's here! I'll be sharing a table with my husband Ryan, so please do come by and visit us at table 109 in Small Press this weekend if you're going! See you there! P.S. Props to Ryan for designing up this little banner above! I'm so excited to share that the incredibly adorable and cool Pygmy Hippo Shoppe is now carrying my zines (Bad Girls Throughout History volumes 1 & 2 and That's Not My Name!) and cards! You can pick them up at the shoppe if you're in LA (and why wouldn't you, if you were), or online through their web store! The owner, Emi, is one of the coolest & nicest ladies I've ever met, so you should definitely head down to stock up on any goods in person and become BFFs with her. She had stated in an interview that the inspiration for the shop was to make it look like a store you'd find on Disneyland's Main Street. How can you not want to visit after that? Send my cards directly through Postable! Shop my tech case collection at Casetify! FOLLOW BEHIND THE SCENES ON INSTAGRAM! All content © 2016 by the artist Ann Shen, unless otherwise credited. If you'd like to license any images, just send me a note. The work and/or all content on the site may not be downloaded, printed, or copied, without permission from the artist. If you'd like to repost something you find here, please make sure you credit the artwork to the artist and link back to this site. Thank you!